Following one of the most divisive general elections in our country’s recent history, with news reports of incidents of hate and bias occurring in other cities, Eugene officials have heard from members of vulnerable communities who are frightened and concerned for their safety. The City Council is committed to making Eugene a welcoming, inclusive, and safe community for everyone. The City Council is committed to standing together with the people of Eugene in opposing hate and bias activities and acts of intolerance committed against our neighbors. The City Council is committed to report incidents of hate and bias and will build upon partnerships with community organizations to track and respond to these incidents. The full resolution can be found on the City of Eugene website. The City of Eugene actively implements its Hate and Bias Response Plan, including responding to and tracking incidents, providing support to victims of incidents and producing an annual Hate and Bias report. Although staff have seen no noticeable increase in recent days in reports directly to the City’s Human Rights and Neighborhood Involvement office or the Eugene Police Department, they have heard of local incidents from partner agencies. The City of Eugene’s Office of Human Rights and Neighborhood Involvement (HRNI) encourages community members experiencing discrimination, hate or bias to report these incidents. According to the Department of Justice only 25-42% of all hate and bias crimes are reported. Organize/participate in counter-action (leafleting, vigil, public statements, etc.) Include Mayor and City Councilors, Commissioners, faith groups, students, and neighborhood groups as potential partners. 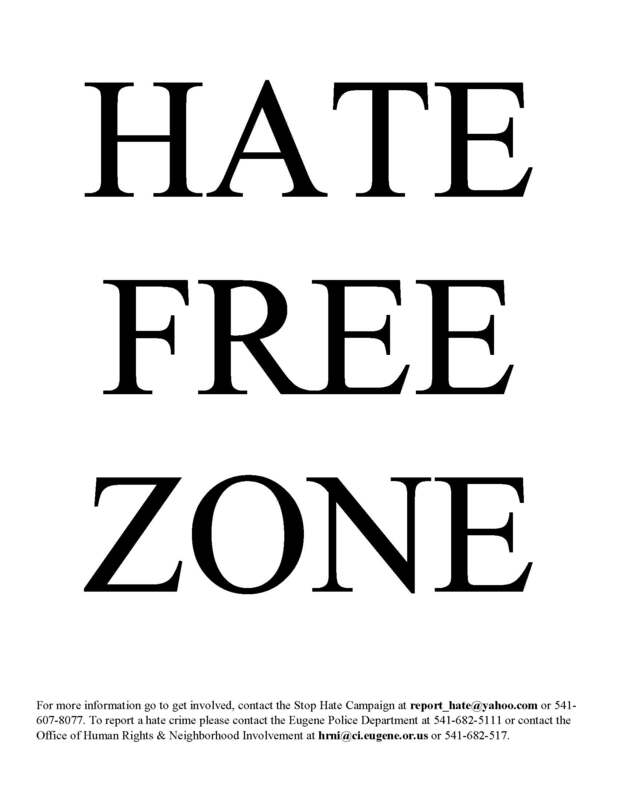 Eugene as a Hate Free Zone: CALC sponsors the Back 2 Back program and including Hate Free Zone activities, by coordinating distribution of red Hate Free Zone posters throughout the City. Employ Study Circles or other community dialogue forums. Provide regular employee and community trainings on hate crimes and response. Visit schools regularly to teach about hate activity, hate crimes and countering hate and bias. Develop clear and consistent leadership messages valuing diversity, inclusiveness and understanding. Support partnerships for response, education, and prevention: Collaborate with community organizations, schools, churches, neighborhood associations, and other agencies. Report statistics and trends in hate activity and target outreach and education. November 19, 2016 in hate and bias.